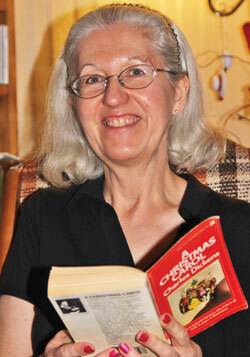 Annemarie Rogalsky prepares to read Dickens’ A Christmas Carol again from the now ragged paperback bought in 1981. Thirty years ago this Christmas, my wife Annemarie and I began a Christmas tradition we’ve continued year after year, with variations. Our first child was in utero the first time we read Charles Dickens’ 1843 novella and morality tale, A Christmas Carol, together. I had grown up watching both the Alastair Sim (1951) and Mr. Magoo (1962) versions of the story on television and had at some time in the past read the book. But we began reading it out loud to each other in 1981, and have done so every year since, finding more gems to think about each time. We’d begin around First Advent. Sometimes we read it in the car on our way from Winnipeg, Man., to St. Catharines, Ont. Often, it was as we gathered around the wood stove in our later home in Ontario. Over the years we observed various kinds of growth in us. Our family added another child, who would then take part in the readings, eventually being able to quote whole paragraphs as we began another stave, Dickens’ substitution for chapters. And we saw that Scrooge’s change was not only to one of charity—a rich man giving a bit of his wealth to the poor—but of justice, as he raised his poor clerk’s salary to create more independence and wholeness. We still read the book each year, anticipating starting near the end of November. Some years we’re joined by our children and their spouses, but one of our in-law’s children finds concentrating on someone reading out loud to be difficult. He has introduced us to the Muppet version of the story, starring Michael Caine as Scrooge. Remarkably, it carries the same messages of change, justice and charity. For many young adults, film is the new literature and it’s good to join them in this changed tradition. Maybe we need to explore some of the other newer versions, like 1988’s Scrooged starring Bill Murray, or go to one of the many CBC readings, now in their 20th year, in support of shelters, food banks, libraries and hospitals across Canada.